Beautiful colors with detailed design pattern handmade in 100% pure wool and intricate design. Perfect as a wall hanging or as a feature rug in a space with subtle interiors. - Enhance your home decor with this gorgeous one of a kind product. 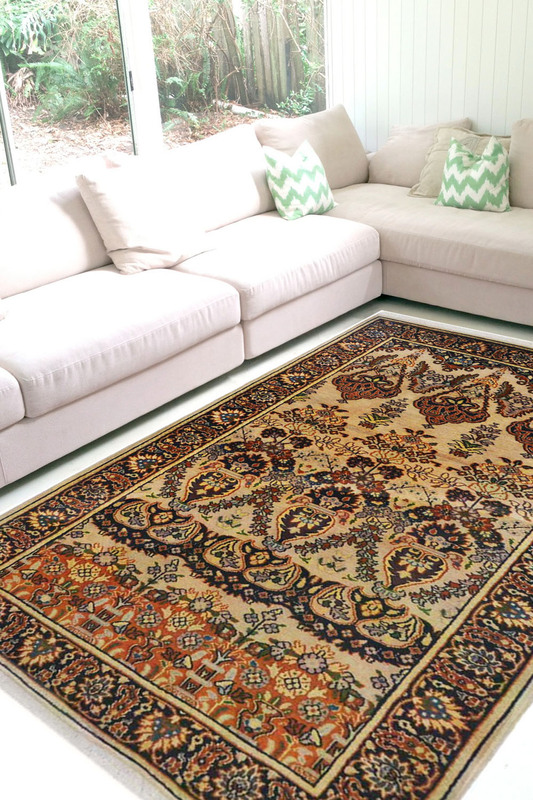 - This rug is a perfect conglomerate of various design patterns and motifs woven in unison. - The design is sharook and has been originated from Persia. - The material used is 100% pure wool of fine quality and it has taken 3-5 months to weave this rug. - The design has a series of motifs which signify different patterns prevalent in the late 19th century. - Primary colors are brown, black and light green on a cream background. - The border has an array of floral motifs and has been very intricately woven.